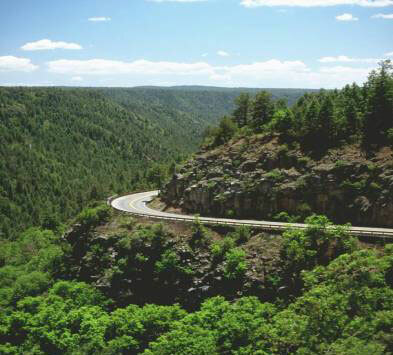 Features such as the Blue Ridge Parkway, Linn Cove Viaduct (pictured), Grandfather Mountain, Great Dining and Lodging and a community known for its hospitality, will all leave you yearning to come back! Rentals are available 1 May thru 31 October, weather permitting. You Must Have Motorcycle Endorsement To Rent From Us, and Experience Riding The Same Size & Weight Motorcycle As The One You Wish To Rent! Please Call Us On Our Last Business Day BEFORE Your Departure To Confirm! Rent this BMW for $135 per day plus insurance and tax. See below for total costs and 3 day discounts. 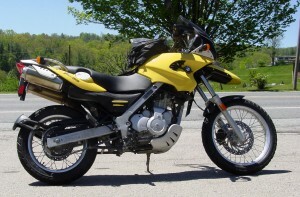 2003 BMW F-650 GS. Very Sure-Footed. 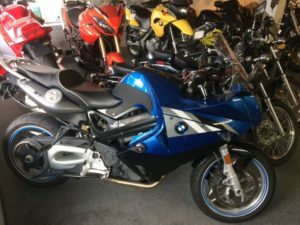 Rent this V-Strom for $135 per day plus insurance and tax. See below for total costs and 3 day discounts. 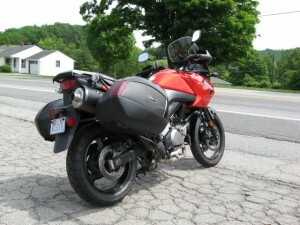 2009 Suzuki V-Strom 650. This is an easy and fun ride. A Detachable Trunk with Passenger Backrest (not shown) have been added. Which Motorcycle Would You Like to Rent?